Once again, the November 2018 ballot in San Francisco is jam packed with measures and candidates. There are 12 State propositions on the ballot, 5 San Francisco propositions, 5 district supervisor races, another 5 elected City officials’ races, and 14 state and federal elected officials’ races, for a total of 41 items on the November ballot. Since San Franciscans can vote only for their own district supervisor, that means voters will face deciding how to cast their votes on 37 issues. I’m limiting discussing my recommendations to a handful of ballot measures, and three recommendations for elected candidate races. Prop. “B’ is being billed as a “Privacy First Policy,” which will be added to the City Charter as new Section 16.130, if passed by voters. Prop. “B” isn’t necessary. The Board of Supervisors can already enact personal-data privacy laws right now independent of the City Charter, without voter approval. They’re just not doing their jobs! Had drafters of Proposition “B” stuck to simply providing privacy protections, I would fully support it. But the drafters introduced a poison pill in the legal text of this City Charter change, so I’m strongly urging readers vote “No on B.” Here’s why. Unfortunately Prop “B” only sets “guidelines” for enacting a data-protection law and sets a deadline, but privacy-protection language is not actually being voted on this November 6. The legal text of Prop. “B” requires that the City Administrator propose an ordinance by May 31, 2019 for future consideration by the Board of Supervisors to establish criteria and rules to protect privacy the City shall adhere to. The intent of Prop. “B” is intended to provide guidance to the City when considering the adoption of privacy-protection laws, regulations, policies, and practices, mainly involving collection and retention of “personal information” such as an individual’s name, social security number, address, telephone number, driver’s license or state identification card number, credit card number, and other categories of personal information. Prop. “B” would hand the Board of Supervisors authority to develop an Ordinance to implement privacy protection principles as it deems appropriate — in its sole discretion — imposing the principles on any or all City boards, commissions, departments, and officials. That means voters won’t have a chance to weigh in at the ballot box on the privacy principles eventually adopted. Unfortunately, §160.130(h) of the Privacy First Policy indicates the underlying principles are not binding on, or self-executing, but rather are intended as a guide to City boards, commissions, and departments. In other words, because the principles are not binding, City boards, commissions, and departments may have an “opt-out” option. The Board of Supervisors and City Attorney could twist the meanings of “not inconsistent with” and “purpose or intent” to pass amendments to gut the Sunshine Ordinance. This provision would allow the Board of Supervisors to tamper with our voter-approved transparency Sunshine Ordinance. Who will be the arbitrator of what is, or is not, “inconsistent”? Opponents of Prop. “B” (including me) worry that Mayor Breed or City Attorney Dennis Herrera — who are both anti-Sunshine — would find a way to weaken the Sunshine Ordinance. Knowledgeable observers suspect that the primary reason Prop. 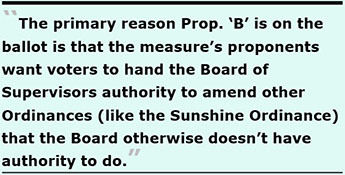 “B” is on the ballot is that the measure’s proponents want voters to hand the Board of Supervisors authority to amend other Ordinances (like the Sunshine Ordinance) that the Board otherwise doesn’t have authority to do. Prop. “B” is a power grab and a sneak attack on our local open government transparency laws to weaken the voter-passed Sunshine Ordinance. The Board of Supervisors can currently add provisions to strengthen the Sunshine Ordinance, and has done so twice, once in 2008 adding a requirement to digitally record all public body meetings, and again in 2015 expanding the list of public officials who must keep daily, publicly disclosable calendars of their meetings. But the Board cannot currently amend existing provisions in the Sunshine Ordinance without voter approval. Subsection §160.130(i) of the “Privacy First” measure would hand authority to amend existing Sunshine provisions to the Board. Voter-approved Ordinances should not be subject to Board of Supervisors twisting. If they want amendments to the Sunshine Ordinance, the Mayor and Board of Supervisors should place amendments on a ballot and let voters decide! Why on earth was this poison pill plopped into the middle of Charter change ballot measure to enact privacy protections? The two issues aren’t even remotely related. 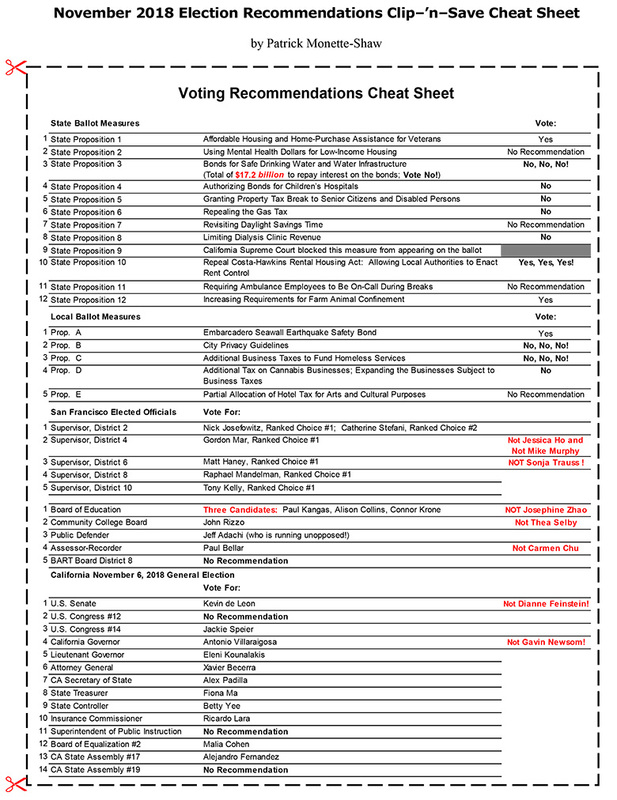 Opponents of this ballot measure include: The Society of Professional Journalists, Northern California Chapter; California’s First Amendment Coalition (FAC); San Francisco’s League of Women Voters; San Francisco Chronicle; San Francisco Examiner; SPUR; San Franciscans for Sunshine; the San Francisco Green Party; the San Francisco Labor Council; the Communications Workers of America; the Pacific Media Workers Guild, Local 39521; and others. Citizens and taxpayers doing business with the City, along with City employees themselves, deserve data privacy protection legislation. That doesn’t mean the Board of Supervisors should be allowed to tamper with voter-approved ballot measures via a poison pill. If Prop. “B” is passed it would give the Board too much power and guarantees nothing. Prop. “C” is officially titled “Additional Business Taxes to Fund Homeless Services.” It will create a “Our City Our Home Fund” by amending San Francisco’s Business and Tax Regulations Code, adding Article 28, Sections 2801 to 2814. Receipts from the Gross Receipts Tax Ordinance will be deposited to the credit of the Our City, Our Home Fund, to be established in Administrative Code Section 10.100-164. The legal text of Prop. “C” specifically states the additional funding will supplement not supplant what the City is already spending on homeless services, meaning the $300 million annually from Prop. “C” will be added to the over $300 million the City is already spending, and the City will end up spending well over a half-billion-dollars annually on services and housing for the homeless. The voter guide indicates spending on the homeless would reach $682 million. 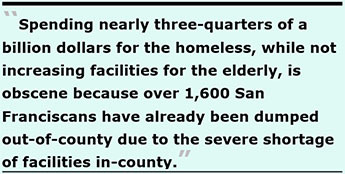 This is obscene, because over 1,600 San Franciscans have already been dumped into out-of-county skilled nursing facilities, sub-acute care hospitals, and assisted living settings because San Francisco has a severe shortage of skilled nursing beds, sub-acute beds, affordable assisted living and board-and-care facilities to keep our elderly and disabled neighbors in-county. And the City isn’t spending one cent on building infrastructure to keep these elderly San Franciscans in the City. Spending nearly three-quarters of a billion dollars for the homeless, while not increasing facilities for the elderly, is just obscene. The $300 million already being spent for homeless services more than likely does not currently include the hundreds of millions of dollars in affordable housing construction in the City funded by the Mayor’s Office of Housing and Community Development (MOHCD). MOHCD has informed the Citizens’ General Obligation Bond Oversight Committee that MOHCD typically requires that 20% to 30% of all new affordable housing units be set aside to house the homeless, ostensibly for both voter-approved bonds, and other sources of MOHCD’s funding. The value of that set aside is not known but could easily be in the hundreds of millions of additional dollars annually. It still won’t be enough, and not too far in the future, the City might be spending $1 billion a year for homeless services, almost one-tenth of the City’s now $11 billion budget. That level of spending will only be a magnet that will draw even more homeless people to San Francisco, and the problems with “street behavior” will only worsen: More poop and pee stinking up the City, and more discarded syringes all over. If Prop. “C” passes, it will lead to expanding the 124 employees on the City payroll in the City’s Department of Homeless Services who were paid a total of $9.3 million in FY 2017–2018. Of those 124 employees, 29 — nearly ¼, 23.4% — were paid over $100,000, plus fringe benefits and eventual City pensions. Nine of those employees were each paid over $130,000 annually. Prop. 10 was placed on the state ballot after initiative petitions titled “The Affordable Housing Act” collected enough signatures to qualify the measure for the ballot. The proponents had requested permission to circulate its petitions with The Affordable Housing Act as the title, and accomplished their goal. They needed 365,880 valid signatures to qualify, and submitted 565,000 signatures, of which approximately 75.8% to 79.9% (451,261) were deemed valid. California’s official Election Guide received in U.S. mail on September 21 titles Prop. 10 with a really long title1, not the title the imitative sponsors had used while collecting signatures. We’ll have to see which title is printed on ballots. If Prop. 10 passes, it will repeal the state’s Costa-Hawkins Rental Housing Act that currently restricts the scope of rent- control policies cities may impose. The Costa-Hawkins Act is a state law enacted 23 years ago, in 1995, that placed limits on municipal rent control ordinances. First, it prohibited cities from establishing rent control over single-family homes, condominiums, and newly constructed apartment rental units built after 1995. Second, it prohibited municipal “vacancy controls,” in effect mandating that cities could allow an apartment owner the right to set rents for vacant units at any amount, typically market-rate prices. Vacancy controls would stop landlords from jacking up rent to market-rate rents between successive tenants. As of 2014, approximately 75% of all rental units in San Francisco were rent controlled. Only units constructed before 1979 qualify for rent control in San Francisco. That means rental units constructed in the 39-year period between 1979 and 2018 are currently exempt from rent control protections. If passed, Proposition 10 would return power to cities and counties and allow them to enact rent control where they previously couldn’t. Prop. 10 would repeal limits on local rent control laws. It would not remove rent control itself, but would allows cities and counties to regulate rent for any type of housing, and would permit cities to limit how much a landlord is allowed to increase rents when a new renter moves in. Prop. 10 does not make any changes to local rent control laws, and it incorporates language from past court rulings into state law to require rent control laws provide a fair rate of return to landlords. Landlords and homeowners should support Prop. 10 for enshrining this into state law, not just case law. California cities officially supporting passage of Prop. 10 include: The City of Berkeley, City of Beverly Hills, City of Oakland, City of Santa Monica, and City of West Hollywood. Sadly, the City and County of San Francisco’s Board of Supervisors hadn’t weighed in as of September 21. On July 24, 2018 a Resolution was introduced to the full Board by Supervisor Aaron Peskin — eventually joined by five other Board of Supervisors as co-sponsors — to support passage of Prop. 10. The Resolution did not need or deserve delays. Notably, Supervisor Asha Safai and Supervisor Katy Tang are not co-sponsors of the Resolution. Weirdly, neither is Supervisor Norman Yee. A week later, on July 31, Supervisor Tang, seconded by Supervisor Safai, introduced a motion that the Resolution be continued to the Board of Supervisors meeting on September 4, 2018. The Board went out on recess for all of August. On September 4, the Resolution was sent back to the Land Use and Transportation Committee, not to the full Board of Supervisors. The Resolution is now scheduled to be heard at the Land Use and Transportation Committee on September 24. If it passes out of Committee, it may or may not be heard by the full Board of Supervisors the next day, and if delayed again may not be heard until October 2, perhaps too late for any meaningful impact. Supervisor Ahsha Safai introduced two amendments to the Resolution during the Land Use and Transportation Subcommittee’s September 24 meeting. One amendment would exempt single-family homes in San Francisco from rent control; the second amendment indicates that application of rent control to new construction and/or single-family homes should be adopted only after an economic analysis from the Office of the Controller. The second amendment appears that Safai is willing to have the Controller usurp the Board’s authority to develop its own independent legislation. The City Controller is not the 12th Supervisor, nor is he elected! If the Board retains both amendments, they will essentially be retaining parts of Costa-Hawkins, a partial, not full repeal. These two amendments don’t belong in this Resolution and should be removed from the proposed Resolution; if necessary, they can be added to future Rent Control legislation. 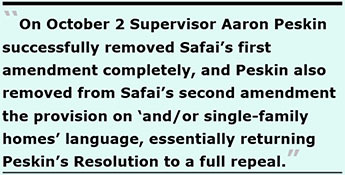 Note: After this article was finished, on October 2 Supervisor Aaron Peskin successfully removed Safai’s first amendment completely, and Peskin also removed from Safai’s second amendment the provision on “and/or single-family homes” language, essentially returning Peskin’s Resolution to a full repeal of Costa-Hawkins on a 9-to-2 vote by the full Board of Supervisors. Other organizations supporting passage of Prop. 10 include: The Coalition of San Francisco Neighborhoods, San Francisco Council of Community Housing Organizations (CCHO), Mission Economic Development Agency (MEDA), San Francisco Anti-Eviction Mapping Project, San Francisco Tenants Union, California Nurses Association, California Teachers Association, SEIU Local 1021, Unite HERE Local 2, United Educators of San Francisco, Harvey Milk LGBT Democratic Club, San Francisco Latino Democratic Club, ACLU of Northern California, Senior and Disability Action, and many other organizations. The California League of Women Voters and the LA Times and the Sacramento Bee newspapers also support passing Prop. 10. By report, Mayor Breed supports Prop. 10. MEDA, CCHO, and the Tenants Union would not be supporting this measure if it would harm renters. Don’t believe the fiction that renters will face eviction if Prop. 10 passes. Vote “Yes” on Prop. 10! Board of Supervisors, District 6: Choose Matt Haney as your first ranked choice. Don’t vote for Sonja Trauss, given her focus on market-rate housing over affordable housing. Board of Education: Don’t vote for Josephine Zhao. She has made transphobic and homophobic slurs about gender-neutral bathrooms in Cantonese-language print media and on her Cantonese-speaking radio talk show and has said the opposite in English-language print media, hoping nobody would translate from Cantonese into English. She has no place on the School Board and if elected, would likely use that seat as a springboard to later run for the Board of Supervisors. Her two-faced statements should not be tolerated! She claims to have withdrawn from the election, but only after it was too late to have her name withdrawn from the ballots. Assessor-Recorder: Vote for Paul Bellar! Don't Forget to Vote on November 6! A blue wave hopes to sweep across the U.S. in November. 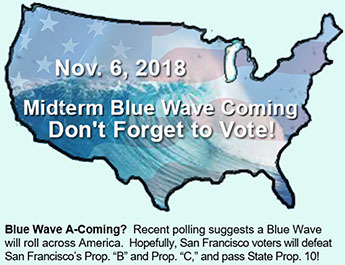 There should be a blue wave in San Francisco, too. You have four weeks to figure out how to vote for everything on November’s jam-packed ballot. Good luck. And don’t forget to vote! After I had posted this article on-line, Mayor Breed finally came out of the closet on October 5 and changed her “no position” endorsement on Prop. “C” to formally opposing it, along with State Senator Scott Wiener and Assemblyman David Chiu.